Daily Illuminator: An Introduction To Discworld (In More Ways Than One)! January 21, 2017: An Introduction To Discworld (In More Ways Than One)! In December, the biggest hardcover we've ever released hit the shelves of your friendly local game shop: the Discworld Roleplaying Game, your comprehensive guide to gaming on the Disc. 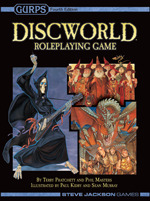 Although it's based on (and fully compatible with) GURPS Fourth Edition, the Discworld Roleplaying Game has been designed as a completely stand-alone sourcebook. So what's crammed into its 400-plus pages? We're providing periodic peeks inside, starting with this downloadable PDF preview of the Introduction. Whether you're familiar with the 2002 version of the Discworld Roleplaying Game or totally new to roleplaying in general, let co-author Phil Masters acquaint you with the wonders of adventuring in the realm created by Sir Terry Pratchett. And very soon, you can look forward to even more of the wonders within . . .